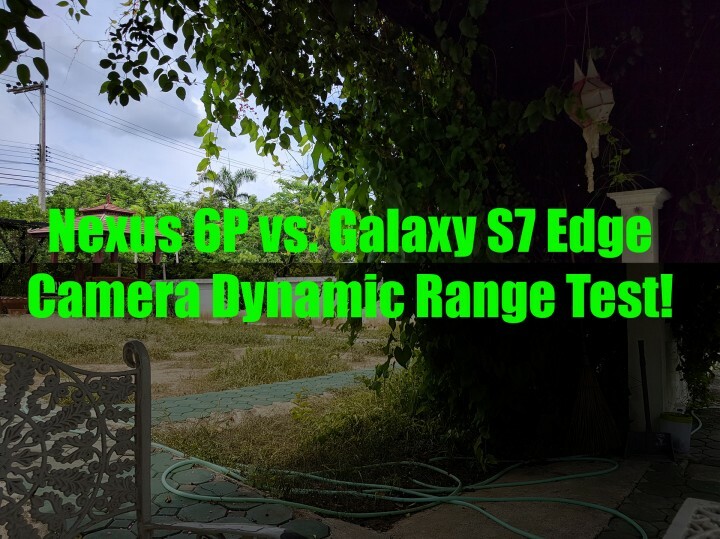 Nexus 6P KILLS Galaxy S7 Edge in Camera Dynamic Range Test! In my last camera low-light shootout, the Nexus 6P came out on top of all 2016 flagship smartphones like the Galaxy S7/S7 Edge and HTC 10 and I wanted to find out exactly what’s going on. Was it the big sensor size? Perhaps good camera software? Or was it simply because better HDR mode? In order to satisfy my thirst to find out why Nexus 6P outperformed new phones, I did a dynamic range test. For those of you who don’t know, dynamic range basically means the difference between brightest and darkest areas of your image. A good camera is able to display a wider dynamic range which results in better photos that portray the photo as realistically as possible. To do this test correctly, I found an area that had very bright skies with very dark shadows of vines. In the first test, I used full auto mode with auto HDR on both the Nexus 6P and S7 Edge. The results were fascinating as the Nexus 6P kept more of the details of both bright skies and the dark vines while S7 Edge struggled to even bring a decent image. The results tell the story why the 6P did better in my low-light tests. Since Nexus 6P is able to better process the lights and darks, it’s able to do better in low-light situations where bright lights are involved. I also took these photos in RAW mode and the results came out pretty good for both phones while the 6P still had some better details even with RAW files with no post processing. Now, I wondered that maybe the Nexus 6P was cheating by processing them in HDR so I did another test with HDR on and off for both phones. When I did the test with HDR on manually for both phones, the Galaxy S7 Edge did much better while 6P did just as well. But when I did the test again with HDR off for both phones, the 6P still was able to bring out details in the skies and vines while S7 Edge struggled like a cheap $20 Android phone. The results tell us that the Nexus 6P’s camera software is superior to pretty much anything else on the market today. While many other online reviews focus on photos where dynamic range wouldn’t be affected, we used an isolated environment and tested the dynamic range only. The results speak for themselves. For those of you who want the best still camera that also processes the best photos in auto mode, Nexus 6P cannot be beaten period. And yes, if you want the best photos out of your Android smartphone, you should always be taking them in RAW but for many, this may be a impossible task unless they know how to use it. That will be for another day but this dynamic range proves the prowess of Nexus 6P’s camera. Of course, we always value your expert opinions (for those of you pro photographers), download the original photos below and tell us what you think, thanks! Note: One of my readers pointed out that the results may have been due to metering mode on the S7 Edge, which I also tested and had no effect on the results for the dynamic range test. I tried all spot, center, and matrix and it turns out the problem is in how the camera software processes it, not metering. good work，man，but i just want raws of the two phones,for dynamic range,you can not be judged by jpegs. Looking for a decent app to take raw photos on the 6p, just curious what app was used to take the raw images? Next story LG G5 Camera 4K Cinematic Test! Previous story S7 Edge vs. Nexus 6P vs HTC 10 Low-Light Camera Shootout!